The north-western suburbs of Norwich creep insidiously up the Fakenham road, consuming old village centres and infilling fields and meadows. But you don't have to go far off of the road to find yourself in the countryside again, along winding lanes among pleasantly wooded hills. And the housing is not unattractive, consisting of small low-rise estates and larger houses set back from the road. There's a considerable snarl-up at the Asda junction when everyone piles in to Norwich to go to work of a morning, though. The challenge of providing churches in areas like this is one that the various denominations take to with enthusiasm, and the main protestant churches, with the possible exception of the Baptists, tend to work together. The Church of England has its old medieval parish churches, of course, which stud this suburbia like little jewels. But for the big new estates it means new churches, and the plucky little Methodists, perhaps mindful of their tradition in this county, built their presence here. 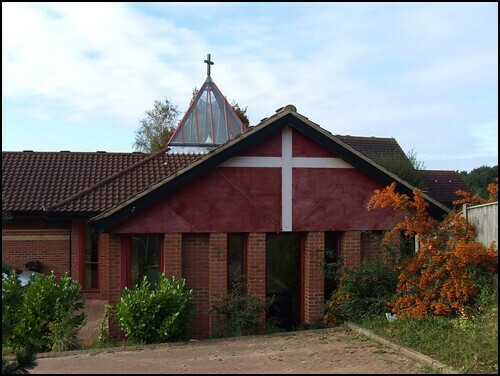 This attractive modern church building, hidden away behind shops in the centre of the new village of Thorpe Marriott, was opened in 1991 by the great Dr Donald English, President of the Methodist Conference. English was perhaps the last major non-conformist figure to register in the wider public consciousness. At a time when Cardinal Basil Hume was Archbishop of Westminster and Dr Robert Runcie was Archbishop of Canterbury, these three highly-respected Church leaders became well known on television and radio, providing a moral and intellectual compass to the issues of the day. How different things are now! It is hard now to imagine such giants filling those positions, or Methodism ever having that kind of influence again. As I have already suggested, in this part of Norfolk the Anglicans and Methodists work and worship together, and so Trinity Church Centre is in joint use, as part of the same group as nearby Horsham St Faith.